What The Heck Was Joe Maddon Doing Last Night? If he were anyone else (and the box score looks like a Tony La Russa special), the Rays manager would be getting flayed this morning. But everybody loves Joe Maddon, and his magnum opus of overmanaging in the Rays' 5-4 win over Boston somehow came back around to directly stave off elimination. That doesn't mean we can't goggle at his inning-and-a-half of whatthefuckery. For the top of the eighth, DH Matt Joyce moved to right field, meaning the Rays would give up the designated hitter and the pitcher would be forced to hit in the cleanup spot. In the bottom of the eighth, Fuld was tapped to pinch-run for James Loney. Fuld would take over in right, Joyce would move over to left, and Sean Rodriguez, who had pinch-hit in the seventh, would move from LF to 1B. Delmon Young would pinch-hit for Jose Molina. A double-switch replaced Young with closer Fernando Rodney, while backup catcher Jose Lobaton took over behind the plate and in the fourth spot in the order, just vacated by the pitcher. When Maddon made his first moves, the game was tied—he was prepared to go into extra innings without his DH and without his starting catcher. "I didn't want to lock us into one guy," Maddon said of not subbing Fuld for Myers. Of course it worked. Lobaton homered on the first second pitch he saw with two outs in the ninth. The end result was logic borne of illogic. Lobaton is a better hitter, and a better slugger than Fuld. But for everything to fall just right so that Lobaton's bat would be needed, while the shredding of the lineup wouldn't come into play? Either Joe Maddon's lucky, or he's working with different metrics than the rest of us. The roster salad nearly overshadowed another baffling decision in the ninth. After shaky closer Fernando Rodney put the first two Red Sox on, Shane Victorino bunted them over. 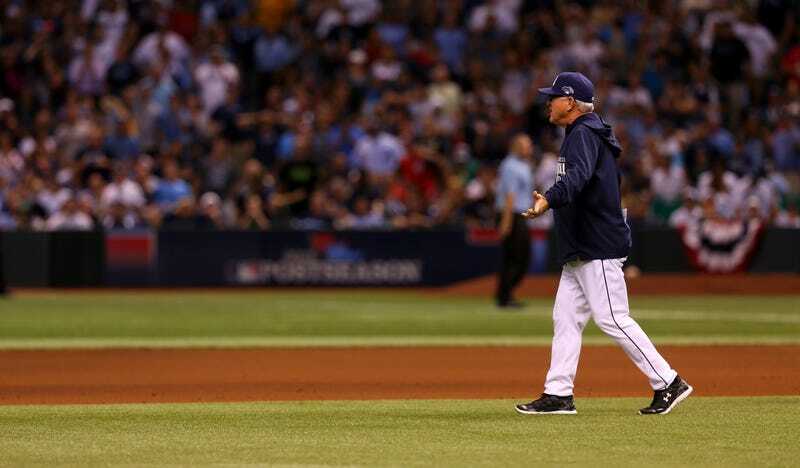 Instead of walking Dustin Pedroia, Maddon had Rodney pitch to him with the infield back. Maddon said he thought "it was best to concede one run and live for the bottom of the ninth." Pedroia grounded out sharply, scoring the tying run—it looked like Yunel Escobar could have tried for the out at home—and it was left to Lobaton's heroics.